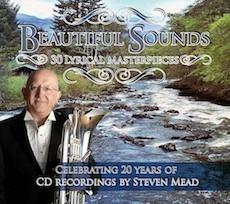 I'm delighted to announce the release of my latest CD, entitled 'Beautiful Sounds' , a double CD of 30 lyrical tracks that are the pick of my recordings from the last twenty years of CD recordings. If you like beautiful melodies played on the euphonium, with a variety of accompaniments, from brass band and wind bands to piano, wind quintet, trombone quartet and multitrack then this album should make you very happy ! "This collection of some of my favourite recording moments spanning twenty years will I hope bring the listener a few hours of relaxation, away from the hectic stress of modern living, and show off the sound of the musical instrument I enjoy playing so much! The recording industry has changed over the last twenty years but the desire of people to listen to music, thankfully remains undiminished. The way we listen maybe changing, moving from LP to CD to digital downloading but one thing is for sure, for a performing musician it remains perhaps the ultimate challenge to create, often in the rather sterile conditions of a recording studio, something that will give pleasure to not only students and specialists in the music world, but also the general public, who enjoy the enrichment that music brings to their lives. Over the years I've recorded a lot of very difficult music, first performances of new works and commissions. This has been central to my life as a soloist. But with an instrument like the euphonium, capable of such beautiful ethereal sounds the universal appeal of this instrument must be it's ability to deliver melodies with a human appeal which audiences find quite captivating. It has been this characteristic I have observed so clearly in over thirty years of travelling. It crosses language and cultural borders with consummate ease, creating a bond of human emotion that is genuine and that stays in the memory long after the ‘live' moment has ended. As a boy I was equally known in my home town of Bournemouth for my angelic (!) soprano voice and, as I've told many times, the euphonium became my second and real voice after my first voice descended in pitch. Selecting the melodies for this collection of previous recordings was difficult but I hope you enjoy the variety of accompaniments and melodies from around the world. For me, this creates a self-revelatory feeling, as I have since earliest memory ‘sang' from the heart. For me every note in a melody has value and meaning, always going somewhere and always carrying an emotion that I hope to convey to the listener. 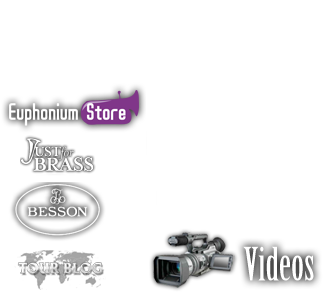 So, I hope you enjoy this twenty-year collection of recorded melodies that will soothe and calm, and continue to show off the extraordinary instrument that is the euphonium." So, perhaps its a great Christmas present for a friend, or maybe you can't wait till then. i don't mind either way.